The easiest way to stock and sell genuine, mil-spec AR-15 parts, or use to assemble rifles on your receivers. Much lower in total cost than buying the parts one at a time. Kit contains only new, current-production, genuine, mil-spec parts; never pull-offs or direct-exchange surplus. 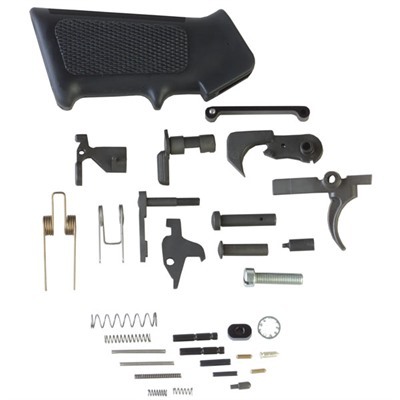 Lower Receiver Parts Kit includes trigger spring, trigger pin, hammer spring, hammer pin, disconnector and spring, bolt catch, bolt catch plunger, bolt catch spring, bolt catch roll pin, selector, selector detent, selector detent spring, (2) takedown detents and springs, pivot pin, rear takedown pin, buffer retainer and spring, magazine catch, button and spring, screw and washer, triggerguard assembly, pin, hammer, trigger and pistol grip. SPECS: Unassembled kit packaged in heat-sealed, poly bag, ­labeled for resale. Fits AR-15 only.